It’s so succinct and so accurate and most of all, so vital. And it makes good sense. Unfortunately, it’s the diametrical opposite of the position taken on most of the programs on HGTV. If you’re planning to buy an old house so that you can rip out every single thing that makes it unique and special and historic and charming, WHY buy an old house? Please, rather than destroying the charm of an old house and sending all that debris to a landfill*, just do everyone a favor and buy that 12-year-old McMansion in suburbia. No one cares if you decide to “re-beige the bathroom” or rip out the black granite countertops and replace them with concrete countertops. Or vice versa. Because of the old-house violence that regularly occurs on HGTV, I can no longer watch these shows. However, due to a recent bout of the flu, I was stuck at home in front of the TV, feeling immeasurably sorry for myself and I happened upon an episode of Property Brothers. 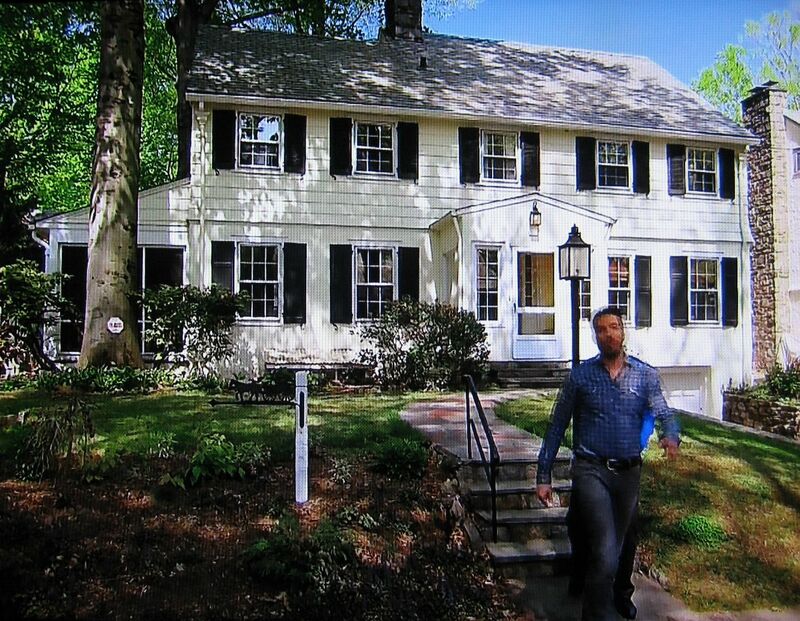 This particular episode featured the home of Tory and Darren (Episode 2, Season 5), and the remodeling of several rooms in this late 1920s New England Colonial. There was so much wrong with what they did, but the remodel that set my teeth on edge was the downstairs bathroom. 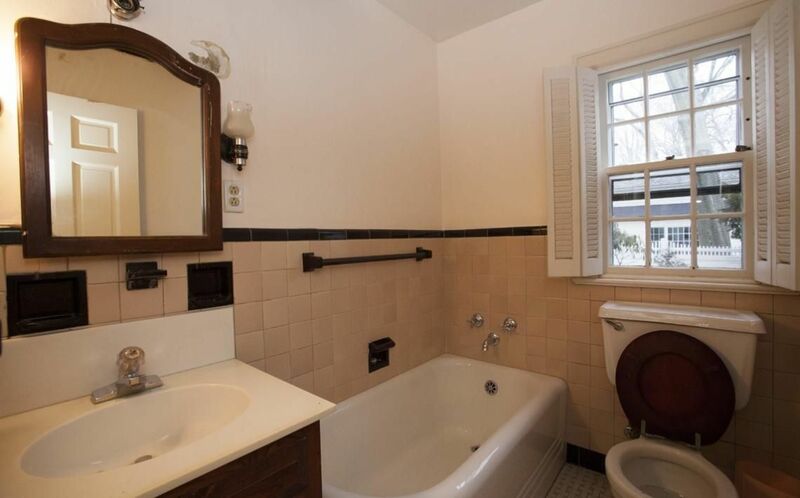 The existing bathroom featured a porcelain-enamel double-apron tub, vintage toilet with wall-hung tank and original basket-weave tile floor with complementing wainscoting. It all appeared to be well-maintained and in beautiful shape (no cracks, chips, etc). The tile floor and walls in that 1920s house were “thick set” or placed in a mortar bed that was 2-4″ deep. 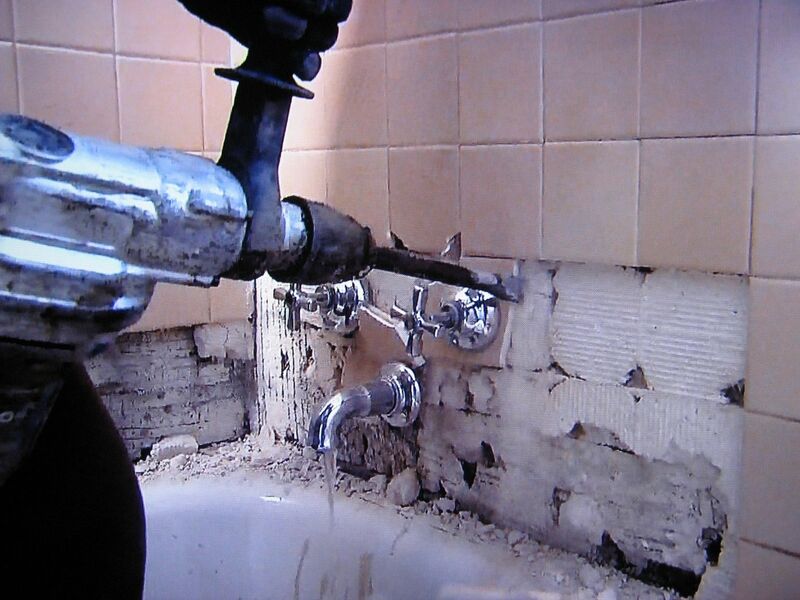 The end result is an incredibly strong tile job that (with proper care) will last for a very long time. I could write for days on the many reasons I loathe HGTV, but another reason is this: It is the worst kind of materialism. It heavily promotes the idea that you must always have the latest, shiniest, brightest, fanciest and newest bauble. If something has an imperfection, then it’s “dirty and tired” and must be removed and put into the waste stream. HGVT breeds a need that nothing in your home will ever be good enough, unless it’s shiny and new. No longer are we trying to keep up with the Jones’ family next door; now we’re trying to keep up with the Hollywood elite and their ilk. It’s a perfect recipe for spiritual and emotional and financial disaster. And this insatiable desire for “shiny” is also destroying the unique features of old houses across America. We need to keep our focus on the First Commandment of Preservation: Thou Shalt Not Destroy Good Old Work. *Up to 40% of all debris in landfills is construction debris. These same people who religiously recycle every scrap of paper show no compunction in sending tons of material to overburdened landfills. It’s despicable. Recently, "Property Brothers" featured the remodeling of several rooms inside this spacious two-story Colonial, somewhere in New England. Several rooms were remodeled, but the destruction of this vintage 1920s first-floor bathroom was the most painful part of the progam. Photo originally appeared at Wnetwork.com. 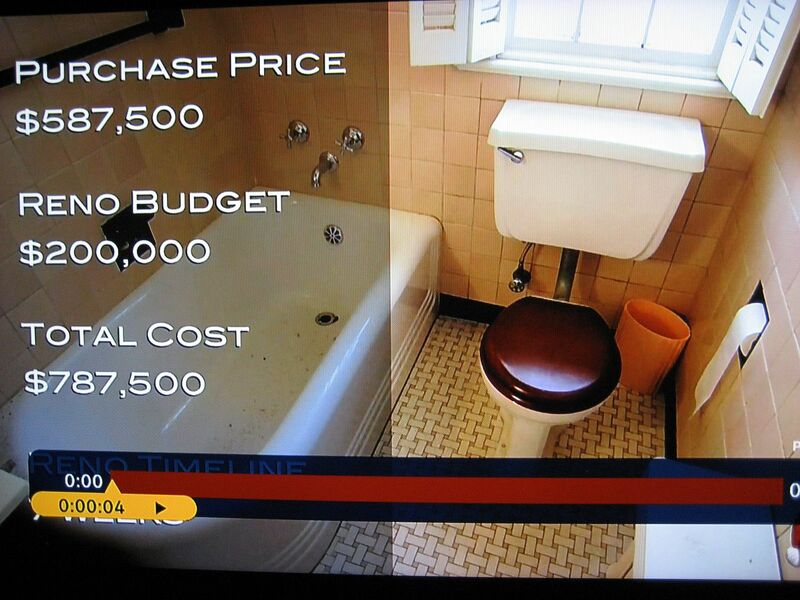 A screen shot from the program shows the vintage toilet, wall-hung tank and double-apron tub. Note the classic basket-weave tile floor, set in several inches of concrete. 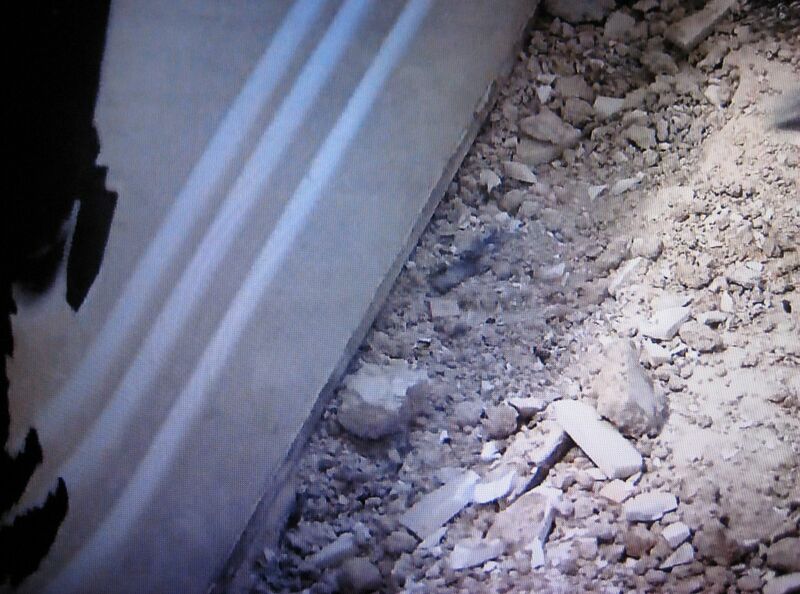 Yes, it takes a jackhammer to bust up that concrete. And the destruction of this double-apron tub makes me crazy. 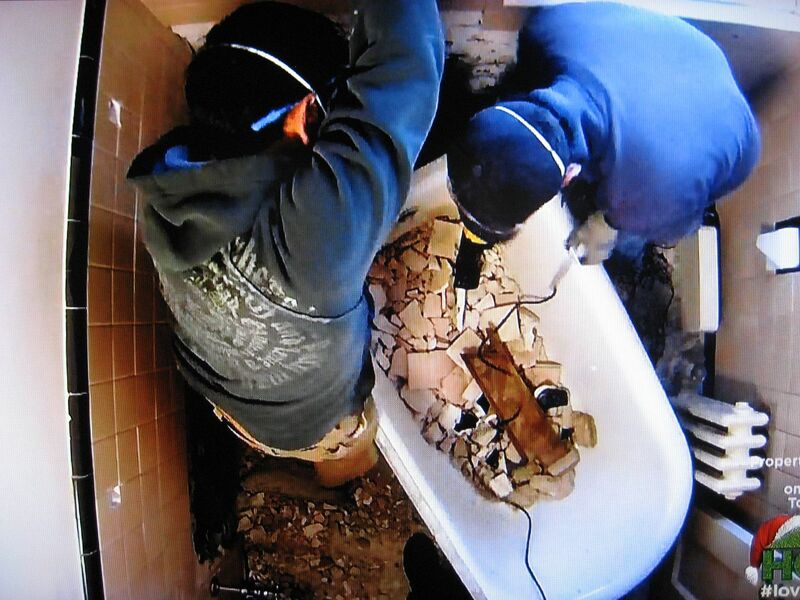 These tubs are hard to find, and the destruction shown here (where the porcelain was chipped off the edge) was probably caused by a few blows from a sledge-hammer. At the very least, this tub could have been salvaged. At the very least. 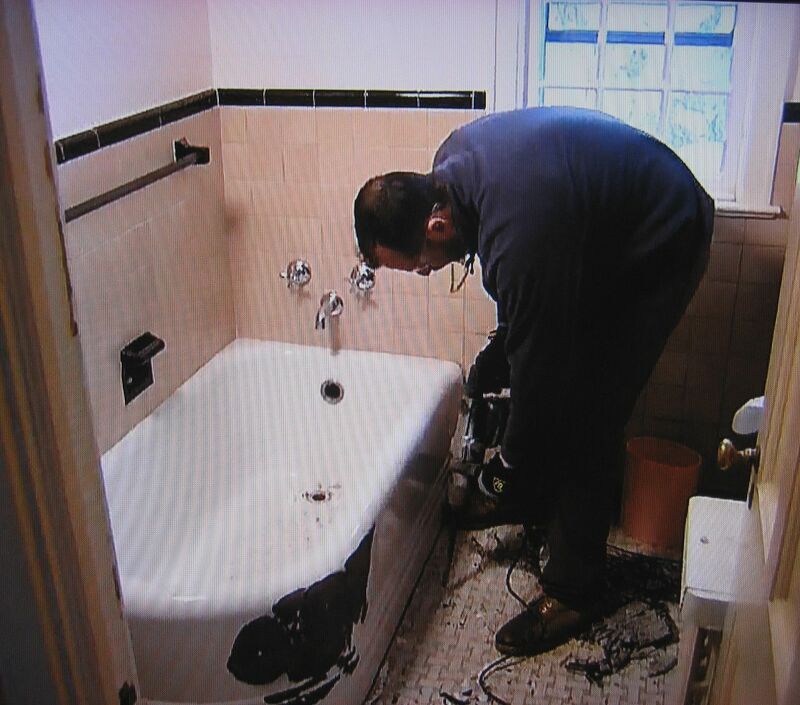 During extreme weather, homeowners are often advised to seek refuge in their bathroom. Part of the reason for this are these thick-set mortar and tile walls. An early 20th Century bathroom is a room with concrete walls, and will offer more protection than other rooms in the house. It pains me greatly to see this "good old work" destroyed. When you're done destroying 4" of mortar, this is what's left. This is such an abhorrent waste. Having completely trashed the double-apron tub, they're now going to remove it. 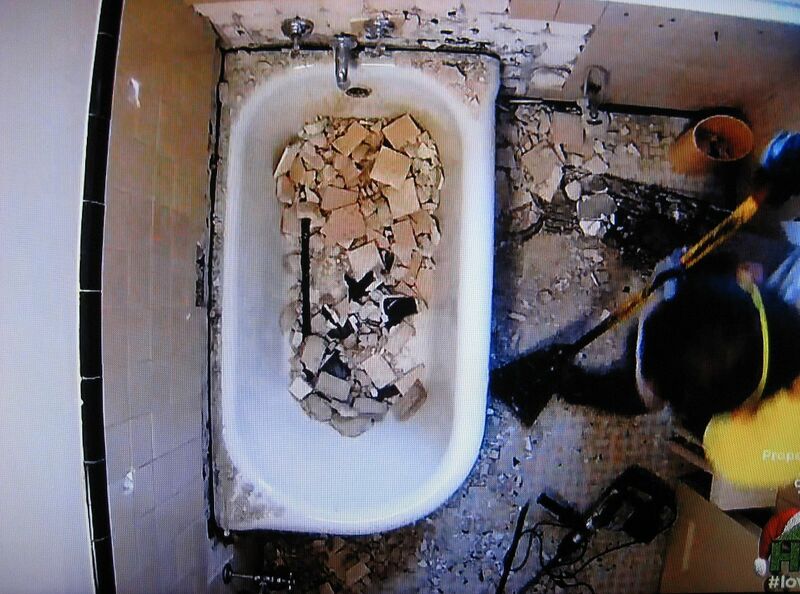 As I said above, there's no reason on earth they didn't - at the very least - salvage the tub. And for what? So they could put up some composite wood walls and an MDF vanity and engineered wood floor? These materials have a 20-30 year lifespan (at best), and then they'll have to be replaced. More garbage for the waste stream. Photo originally appeared at Wnetwork.com. They had timeless elegance and beauty. And they threw it right into the trash. Up to 40% of all debris in landfills is construction debris. These same people who religiously recycle every scrap of paper show no compunction in sending tons of material to overburdened landfills. It’s despicable. You’ve made the arguments against HGTV so persuasively; I can’t imagine saying it better. But I would add that in addition to the greedy aspirational aspect there’s also the mindless drone part — almost all of the people on HGTV shows want to decorate the same way (or did back when I watched some of them; it’s been close to ten years). They must have whatever is of the moment with no consideration for what is timeless (basketweave tile floors being an example of the latter). 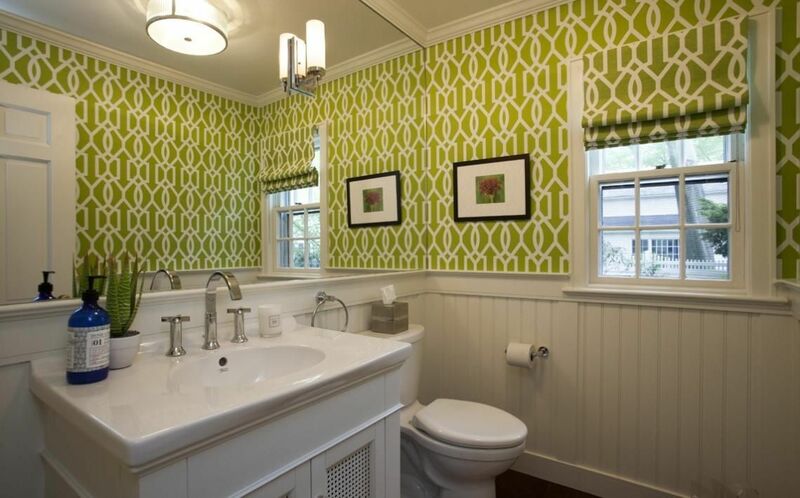 Judging by the after picture, I think the results are pretty for today but when acid green and Wearstler trellis aren’t in style this bathroom will project “dated”, not “deluxe”. Thanks for your comment, Barb. I think i’m going to be sick. WHY WHY WHY? It has never ceased to amaze me that such an illogical path must be followed. Many times in my past, long before I happily found this group and blog, I wondered why such solid work must be replaced. I would think, “it looks good to me” and just shake my head. It’s good to see that I am not alone. You couldn’t have said it better, “If you’re planning to buy an old house so you can rip everything out, why buy old?” Pardon me for paraphrasing it. The loss of the grandness of those homes is simply not properly appreciated. Even the math is hard to swallow. Isn’t the maintenance of fine vintage construction less than the cost of tearing it out and buying new? It is a labor of love to put into your home the things it needs to continue giving you the comforts of home. Thanks for renewing the lesson, Rosemary. Do you read savethepinkbathrooms.com or RetroRenovation.com? Both blogs would totally agree with you on this. That was a beautiful bathroom, with great craftsmanship. I just am shaking my head. I hate it when real estate listing say, “Needs some updating!” NOOOOO! Leave that green tub right where you found it bucko! I love this point of view and agree. So many people tear out perfectly good materials and workmanship and replace it with inferior. Even if you had unlimited money some old materials are hard to get if they can be found at all. My biggest cringe moment with most of the reno shows are when the demo hammers come out. They smash everything to remove it so no one can ever use it again. It isn’t bad enough to remove solid wood cabinets or tongue and groove paneling; you have to smash it to bits so a dumpster is the only place it can go. The other thing that is predictable is the kitchens are just about interchangeable, not unique or original in any way. Dark cabinet /light granite or reverse, repeat. I would love to see shows that show you how to work with the features of the house and what makes them so special. The problem is you have to have a sponsor and restoring doesn’t have the budget.